We create a community of active music makers! Both adults and children are engaged in the musical activities. We explore rhythm with our bodies, play instruments, sing songs and have a great time! Children are allowed to move freely around the room. We encourage the children explore at their own level. Children play with rhythm instruments like egg shakers, drums, triangles, etc. Everyone has a really good time at the end of class "jam sessions". We use multicultural songs, rhythmic chants and rhymes, songs without words (which is how children learn the best)! Each 9 or 10 week session comes with a CD of all the songs we sing in class, with a beautiful songbook. The CD changes every 10 weeks (rotated over 3 years). How does the mixed ages work in class? 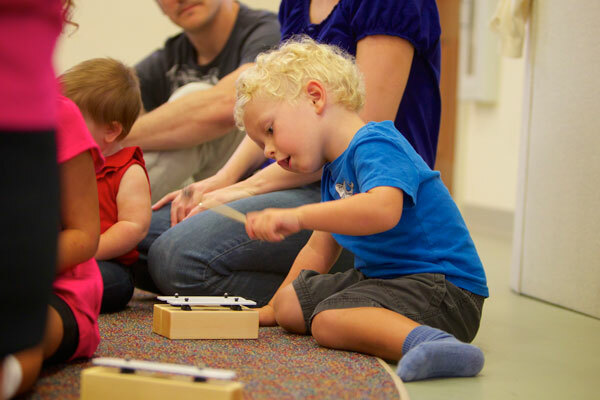 Each child is developing musical (and language) skills at their own pace. So a 1 year old will experience the class differently than a 3 year old; and the 1 year old will be learning from the older children. After 25 plus years of research and music making in the music education field, we know that this works! And it is so nice to be able to bring siblings. Just think of the way they learn language. They "participate" very little during the first six months to one year, but without the exposure, they would not be able to develop speech as they grow older. Although their participation will be passive, they are very actively absorbing what they are seeing, hearing, and feeling so they can act upon it as their body and nervous system matures. Can a different adult attend class with the child? We have caregivers, moms, dads, grandparents all attend. Siblings through 7 months are free.